This isn’t the first time the Nashville Predators have been the odds-on favorite to win a series, but it may be their first time being unanimously chosen in all expert predictions to knock out the Avalanche – most predicting in six or fewer games. With Nashville owning the best record in the NHL through the 82-game regular season, capturing the Presidents’ Trophy in the process, the spotlight remains fixed on the Music City as the Predators attempt to grind their way back to the Stanley Cup Final for the second straight season. The Avalanche, however, may not have been so lucky in their draw. Earning a playoff spot by collecting a single point against the St. Louis Blues in the final game of the regular season, Colorado locked in a meeting against the Predators – a team they’ve lost their last 10 matchups against. 1) Can Nathan MacKinnon carry the Avalanche? There’s zero question that the Predators win the battle when it comes to which team has the deeper lineup, featuring six players with 50 or more points in the regular season and boasting a top-six that serves as one of the deadliest in the league. On the other side of the ice, though, is a player who could garner his first Hart Trophy nod as the most valuable player in the National Hockey League. In 74 games, MacKinnon has registered 39 goals and 58 assists for a grand total of 97 points on the season – easily besting any other player on both rosters and ranking fifth overall across the entire league. The only other player remotely close to MacKinnon in points was Mikko Rantanen with 84. For the Avalanche to be remotely competitive in this series, MacKinnon must find a way to not only break through the stout Nashville defense, but also get pucks behind Vezina front-runner Pekka Rinne. MacKinnon can steal a game for Colorado behind his scoring potential, but he’s going to need to be the best player on the ice for both teams in more than a single game for the Avalanche to produce an upset. It’s no secret that Nashville often finds itself in penalty trouble this year. With 372 penalties called on them this season, an average of nearly six penalties taken a game, the Predators were the most-penalized team in the NHL by a double-digit margin. Even with the constant stream to the penalty box, it hasn’t been all bad. Nashville owns the sixth-best penalty kill in the league at 81.9 percent and is tied for the third-most shorthanded goals forced with 10 – four of those coming from forward Austin Watson. The playoffs, though, are a bit of a different beast. Those little mistakes a team makes in the regular season could end up being quite costly during the postseason. Colorado’s powerplay is eighth-best in the NHL, notching 65 goals in 296 attempts. 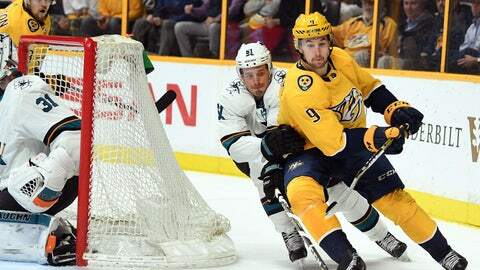 With how the Predators like to play fast and aggressive, tending to lead to an over-abundance of penalties, they could end up biting Nashville and potentially swinging the outcome of the series. It’s hard to ask a team to change how they’re playing when they’ve been playing the same way for 82 games. That being said, if Nashville can keep their penalties relatively in check during this series, it should easily go the way they want it to. If they don’t, however, the Avalanche could turn it around very quickly. Comparing roster to roster, the Predators may be one of the deepest teams in the entire league – one of the main reasons that many are picking Nashville as the early Stanley Cup favorites this postseason. And that could play a huge factor in determining how this series swings. Colorado is already entering the playoffs without their starting goaltender, Semyon Varlamov, and one of their cornerstone defensemen, Erik Johnson. Relying heavily on backup Jonathan Bernier, a goaltender that Nashville last saw in game six of the Western Conference Final last season, the Avalanche will need him to stand on his head against a Nashville team that strikes in waves. That’s one of the keys to the Predators attack – it’s never-ending. The Predators are constantly attacking opponents in their own zone and it’s never a matter of which line is on the ice. All four lines are deadly and can equally cause the same level of damage. Avalanche head coach Jared Bednar may also find it increasingly difficult to get the right matchup when putting out his top line. With a possible four home games, Nashville will have the last change in those and can match up better against both MacKinnon and captain Gabriel Landeskog. Yet, even without the last change, the odds of MacKinnon starting against a different defense pairing than Roman Josi and Ryan Ellis or Mattias Ekholm and P.K. Subban will be quite slim. With so much offensive and defensive depth for the Predators, it could just be too overwhelming for Colorado. Colorado may just be too overmatched in this series and, unfortunately, could be exposed very quickly by Nashville’s size, speed and defensive prowess. Unless the Predators absolutely fall apart in all facets of the game, including seeing Rinne turn from Vezina favorite to sieve, it’s going to be an extremely difficult road for the Avalanche. They may be able to steal one game, possibly two, but Nashville will just be too much in the end.